Belfast, Northern Ireland was once a city full of police checkpoints and barricades, bullets and bombs. It has only been within the last fifteen years that the country, which is part of the United Kingdom but located on the island of Ireland, has moved away from this violent way of life. Although the country is no longer facing a low-intensity war as it had for thirty years, from the mid-1960s until 1998, its progression toward peace is still moving slowly. Neighborhoods are segregated; Catholic Nationalist communities (who want a united Ireland) can be recognized by their pro-IRA graffiti as well as the Irish Tricolour flying near doorways while Protestant Unionist communities (who want Northern Ireland to remain part of the United Kingdom) are known by curbs painted red, white, and blue and the Union Jack flying in the streets. I set out in my research hoping to learn how this sectarian environment and the history of violence are affecting young peopleís lives in Belfast today and through my interviews I have gotten a glimpse into the answer. 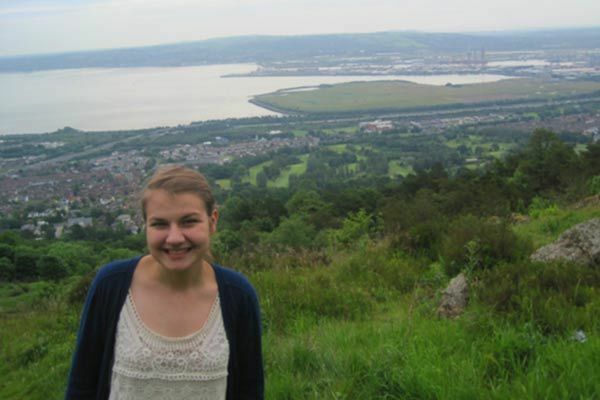 In my research I interviewed fifteen young people from various underprivileged neighborhoods, both Catholic and Protestant, in Belfast between the ages of 14 and 21. I asked them a variety of questions ranging from community to antisocial behavior (both sectarian and nonsectarian) to the future (both personally and what they saw for the future of Northern Ireland). I was able to talk to the youth in their homes which I believe gave me a much better look into their everyday lives: their words were very important and at times quite moving, but getting to take in where they live, what their families are like, and how they live their everyday lives helped me to understand where some of their answers were coming from. Going into my research I was most interested in hearing what these young people had to say about the future. Northern Ireland has seen a lot of pain and I firmly believe that these young people are the future and can make a change toward a more peaceful nation, as the lack of war does not equate to peace and it cannot be said that Northern Ireland is at this point a peaceful country. For the most part the responses I received regarding a shared future for Catholics and Protestants in Northern Ireland were positive: none of them saw a change happening in the near future with the current politicians in charge (as many of the politicians were involved in the Troubles and are stuck in the past) but many were open-minded toward the other group and seemed willing to work together in the future. It was clear that these young people have been affected in various ways by sectarianism in Belfast, many having minimal interactions with young people from the other community. This made me wonder why more significant progress was not being made in the country, particularly when many citizens have shown an interest in less hostility and a shared future. I was working with Queen’s University School of Law and was invited by them to attend a politician panel at Stormont, Northern Irelandís parliament. It was there that I realized how out of touch the politicians were with the people of Northern Ireland, particularly the youth. This helped me understand what the adolescents were saying about the current generation in leadership being stuck in the past and out of touch with the needs of young people. It struck me that politicians were twisting situations to make it sound as though they were the only ones capable of fixing things when in reality they are slowing progress. I believe I got a glimpse into Northern Irelandís future in my conversations with these young people. Even though many of the people to whom I spoke came from underprivileged backgrounds and knew of people involved in sectarian and nonsectarian antisocial behavior, most of my interviewees wanted to move beyond that and hoped for a better Northern Ireland. As the larger report will be given to the government of Northern Ireland, I sincerely hope they will take steps to give these youth what they need in order to build a better future. Through my research I have become even more passionate about the situation in Northern Ireland and how young people can create a more peaceful and cooperative environment in the hostile land. I feel as though I got to know and understand the city at a personal level. Although prejudiced toward each other, everyone was incredibly open to me and very welcoming. I hope giving the young people an opportunity to share their story and talk about things that are often taboo to bring up was helpful for them, as I found the experience to be incredibly beneficial to me. As I worked with Queen’s University Belfast, I learned of a new Master’s program which will be starting in the 2014 school year which is in Conflict Transformation and Social Justice. I had such a wonderful experience conducting research related to these topics and learned so much that I would like to pursue this field further and will be looking into this program as a possible graduate school program. I would like to thank the Nanovic Institute for providing me the funds to explore my passions in a land I have come to love even more. My eyes have been opened and I intend to further explore all that this subject and nation have to offer in the future! 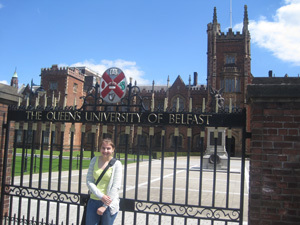 After graduating the University of Notre Dame, Katie was accepted into the Conflict Transformation and Social Justice master’s program at Queen’s University Belfast. She is featured in a November 2015 edition of the “What Would You Fight For?” video series. Originally published by Jennifer Lechtanski at nanovic.nd.edu on November 24, 2015.